Was anyone hurt or killed? Four people were injured. Although the on-site civil defence records say that there were no deaths there was in fact one fatality. Other Information Wife of W.C Fisher of 113 Akerman Road, Brixton. Injured at Prima Road. Died the same day at South Western Hospital. 14.9.40 17.17 Prima Road between Brixton Road and Offley Road and also Camberwell New Road between Brixton Road & Foxley Road. All casualties have been cleared. Prima Road is completely blocked. 14.9.40 17.34 Supplementary Report. 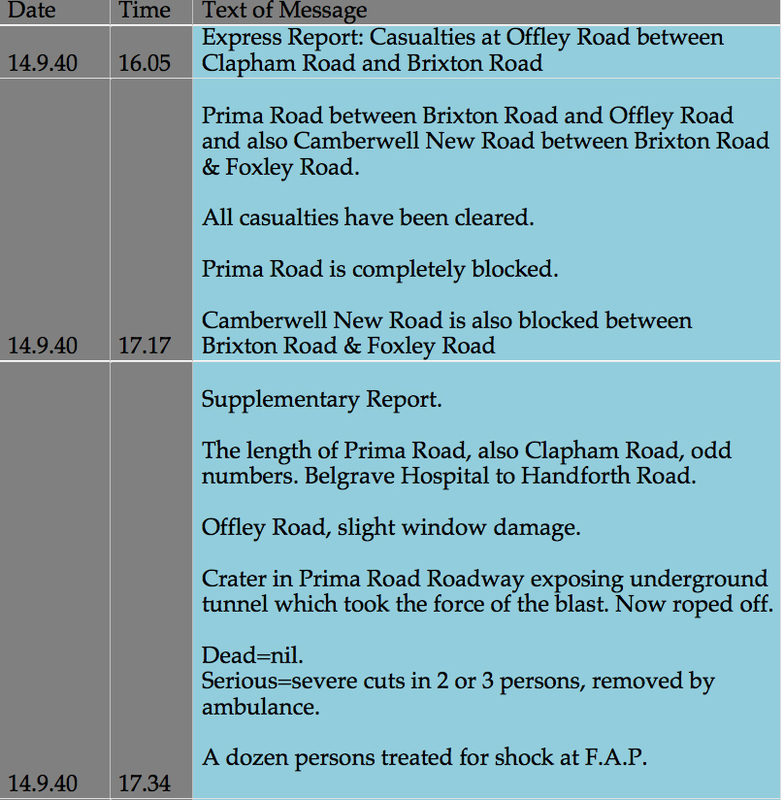 The length of Prima Road, also Clapham Road, odd numbers. Belgrave Hospital to Handforth Road. Offley Road, slight window damage. Crater in Prima Road Roadway exposing underground tunnel which took the force of the blast. Serious=severe cuts in 2 or 3 persons, removed by ambulance. A dozen persons treated for shock at F.A.P. 14.9.40 17:34 2 High Explosives. 1 in Prima Road opposite Offley Road, the second in garden rear of 9 & 11 Clapham Road between Prima Road & Handforth Road. Time 16:07 hours. No's 9 & 11 Clapham Road staircase, ceiling and rooms wrecked. Fabric of building intact except for fragments. No appearance of likelihood of collapse. Sharwood's pickle factory, windows out & doors blown in. All windows broken along the length of Prima Road, also Clapham Road odd numbers from Belgrave Hospital to Handforth Road. Crater in Prima roadway exploding underground tunnel which took force of the blast, now roped off. Serious - severe cuts on 2 or 3 persons, removed by ambulance. 14.9.40 19.25 Supplementary Report A tunnel 12 ft in Diameter has been exposed at base of crater in Prima Road. High Explosive bomb has exploded in garden space at back of number 11 Clapham Road, rear of houses in Clapham Road and Sharwoods Factory in Offley Road. Casualties have been dealt with, all wardens have returned to post. Police have situation in hand. R/R/P arrived 18:10 in Prima Road. 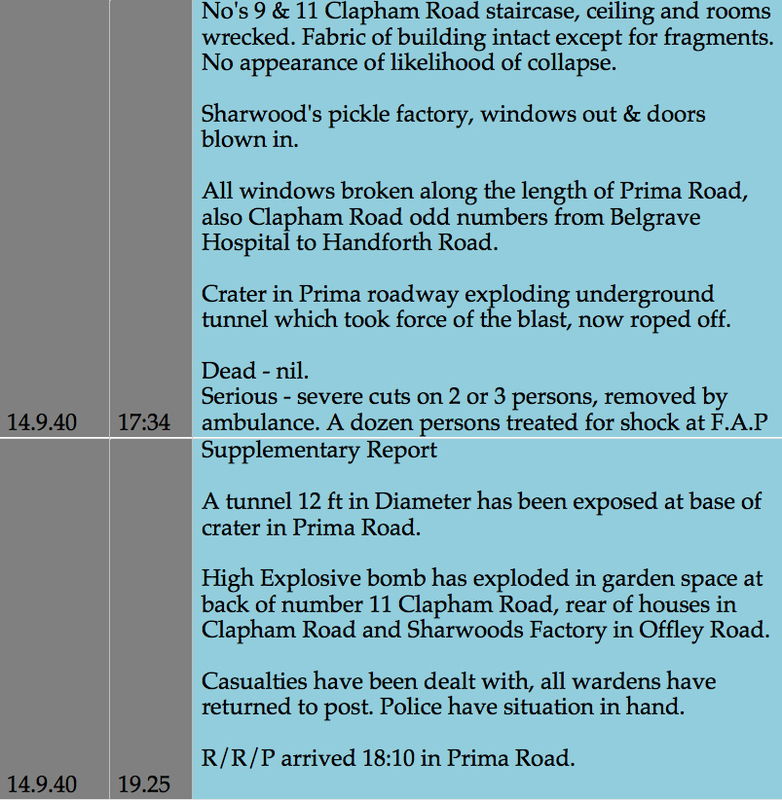 14.9.40 22.45 1 to 11 Prima Road - 15:55 - High Explosive, also 11 Clapham Road rear 15:55 High explosive. 154 Prima Road badly damaged, houses in Offley Road windows blown out. 11 Clapham Road badly damaged. 9 to 25 slightly damaged. Shops from Claylands Road to Ashmore Street windows blown out. 2, 5 & 10 Brixton Road, windows blown out. Public shelter at 2 Brixton Road entrance door blown down. Casualties 3 serious, 6 slight. 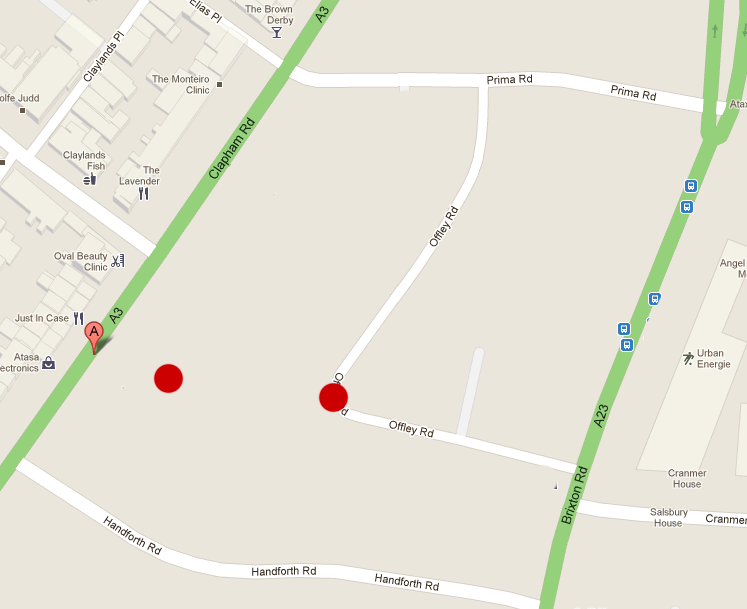 Prima Road from Brixton Road to Offley Road roped off owing to small crater exposing disused 12ft sewer. All residents of damaged houses approached & either remaining in their homes or accomodated with friends except number 1 Prima Road where 2 people require evacuation. 1 lady of 85 and 1 slight casualty. Public shelter at 2 Brixton Road was not in use during raid and was found to be intact except for damage mentioned above.